Public transportation is usually a safe and affordable way to travel, but it’s not without its risks. Just like any other motor vehicles, buses are driven and built by human beings, and people make mistakes. Sometimes, these mistakes are more serious than others. Whether you were a passenger onboard a bus, or you were in a vehicle struck by a bus, you need the services of a qualified attorney. The Bernard Law Group has the skills necessary to aid you in your quest for compensation. We understand the complex nature of the applicable laws, and we can put that expertise to work for you. Driver negligence- This can take many forms. In today’s day and age, the most common distraction is a driver texting or talking on a cell phone. Distractions can also come in the form of eating or toggling through the radio. Other dangerous behaviors include speeding, making lane changes when not safe to do so, and other reprehensible acts such as intoxicated driving and fatigued driving. 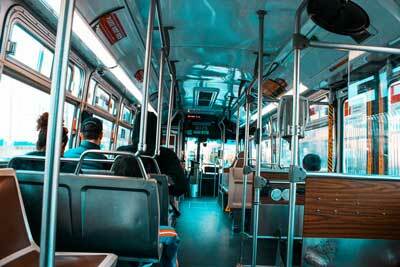 Maintenance Issues- Bus operating companies are required to keep their vehicles up to standards set forth by law. If a driver loses control of a bus, it might be the result of irregular maintenance or a failure to fix glaring flaws caused by wear and tear. Negligence of another party- Sometimes, the liable party is someone else who failed to adhere to the rules of the road. As you can see, determining liability and cause is far more difficult than it might initially seem given the numerous parties that could be involved. Our lawyers know how to sift through the relevant information and determine liability, and we want to put our skills to work for you. While you focus on healing from your injuries, let us negotiate with the insurance company and the defendant’s legal team on your behalf. We’ll keep you updated along the way and do everything we can within the means of the law to gain you recompense for medical bills, lost income, pain and emotional damage, and more. Contact us today at 1-800-418-8282 to receive a free consultation. Our lines are open around the clock, so there’s no need to wait. Call today and let the attorneys at the Bernard Law Group take you under their wing.